The atmosphere was part family reunion, part auction crowd. Some came to meet and greet. Most were there to watch. Men with white beards and denim pants with suspenders and women in pastel dresses and lacy white coverings predominated the scene. A few children in straw hats and long, plain dresses held tight to a parent’s hand. This entertainment was too lame for teenagers. Many of them were already at the beach. Read the rest of Bruce’s post “When the bus comes in, the fun begins“. If you visit the Sarasota area and the Pinecraft community, there is quite a bit to do. 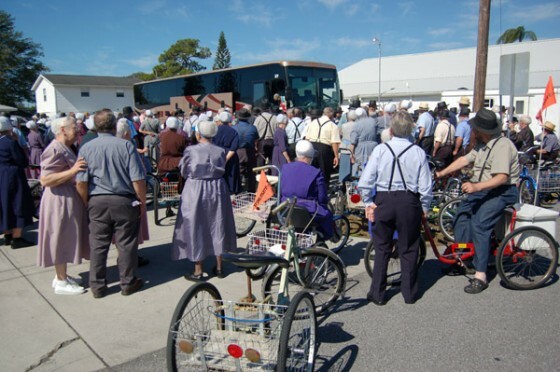 Read more on local newspaper the Pinecraft Pauper, find Amish restaurants in Florida, or view listings of Amish furniture stores in Florida. Maybe you could do a post on the 4th annual “Anabaptist Identity Conference” scheduled in Pinecraft for March 12-14. Its a gathering of people from various Anabaptist groups striving to maintain the old Anabaptist spirit and teachings that got this whole thing arollin’ about 500 years ago. Beth, Mike, thanks for the heads up on those two! We had 6 inches of snow in my town in MS last Friday; I’m almost ready to catch a bus to Pinecraft myself. Thanks for the interesting post. Thanks Ann, I think the Pinecraft bunch has the right idea. Here in Poland, there are literally 3-foot icicles hanging of the tops of the buildings right now. Not a good idea to be walking around underneath, especially today when everything started melting a bit. My husband and I have been to Pinecraft and it is delightful. It is on the slow and easy side of life which we feel is what vacation is all about. Young people might be bored there but it is good to show them another way people live and learn another culture’s way of life. There are modern business’s and restaurants for those who need a worldly fix. I think if you visit Pinecraft you will be glad you did and just maybe you might want to go back.